Although pizza is not the healthiest food choice -- it tends to be high in saturated fat and sodium -- you can enhance its nutritional benefits by using ingredients such as whole wheat pizza dough. Whole wheat pizza dough is relatively low in fat and rich in fiber, so it offers a number of nutritional benefits. Exact nutritional values may vary by the brand, so check your specific product's label for the actual values. Whole Wheat Pizza Dough has 220 Calories and 8.00 g of Protein per 100 gram serving according to the nutrition facts provided by the USDA Food Composition Database. 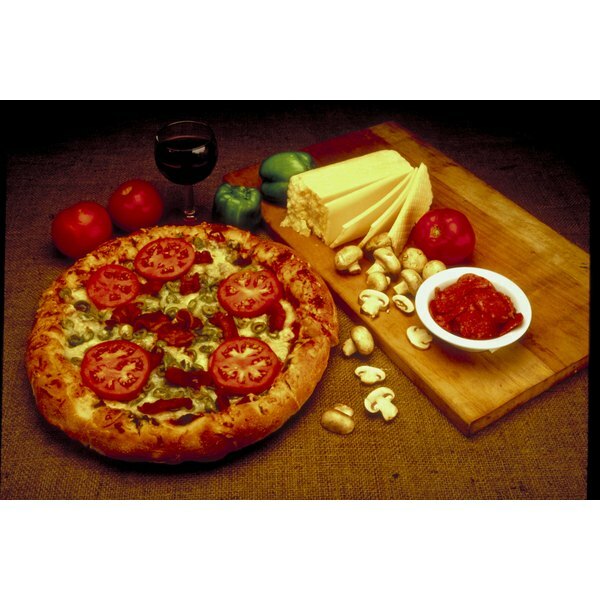 Whole wheat pizza dough has 120 calories per 2 oz. serving, which is slightly less than the 130 calories in 2 oz. of regular pizza dough. If you're dieting, whole wheat pizza is the better choice, although you can burn off 10 calories in as little as three minutes of weightlifting. Whole wheat pizza dough is low in fat, with 2 grams per 2 oz. serving. None of the fat in whole wheat pizza dough comes from saturated or trans fats, which can heighten your risk of heart disease by increasing your cholesterol levels. Whole wheat pizza dough is rich in carbohydrates, with 23 grams in each 2 oz. serving. Carbohydrates are your body's primary source of energy, but limiting your carbohydrate intake may be beneficial for dieting. Whole wheat pizza dough is slightly lower in carbohydrates than regular pizza dough, which contains 24 grams per 2 oz. serving. Whole wheat pizza dough is rich in fiber, as it contains 4 grams in each 2 oz. serving. A 2 oz. serving of plain pizza dough contains just one gram of fiber. Dietary fiber is important because it promotes healthy digestion, increases feelings of satiety and helps stabilize blood sugar levels. Protein is a vital nutrient because it supports the growth and maintenance of muscle, skin and other bodily tissues. Each 2 oz. serving of whole wheat pizza dough contains 4 grams of protein. You can add protein to your pizza by topping it with chicken or other meats. Whole wheat pizza dough contains a moderate amount of sodium -- each 2 oz. serving contains 170 mg, or about 7 percent of the daily suggested intake. Consuming too much sodium may increase your risk of high blood pressure. Whole wheat pizza dough doesn't contain many vitamins and minerals, but a 2 oz. serving does provide 6 percent of the daily recommended intake of vitamin C and 2 percent of the daily suggested intake of both calcium and iron. Can Too Much Protein Raise My Blood Pressure?